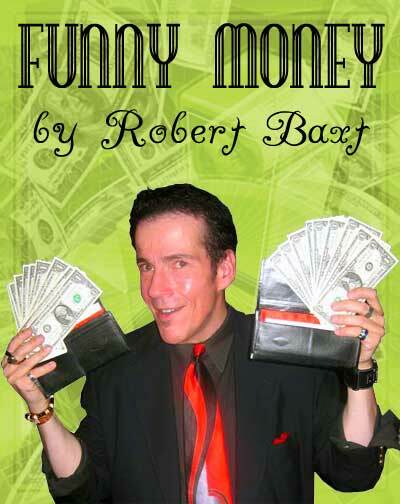 Baxt’s “FUNNY MONEY” Comedy Routine on DVD with WALLETS INCLUDED!! A Comical, Easy to do, “Bills Across” routine for you! 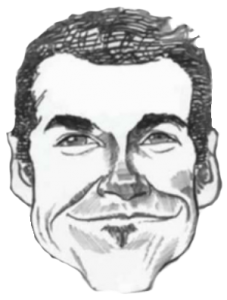 Robert Baxt, a F.I.S.M. winner for Comedy, releases his handling of the classic “Cards Across” trick, but with a simple and easy self-working method that uses the money for greater audience impact! No sleight of hand and no fussy moves are needed! The trick all but works itself! Great for close-up, parlor, or stage! A wonderful routine for strolling and restaurant workers! With two spectators, one on either side of the artist, two checkbooks are shown and ten one dollar bills are cleanly counted out from each one by the volunteers. Giving each person $10 to hold, the performer politely asks them to sit on the money so he can’t get to it. The fun starts as you magically cause cash to travel invisibly from one spectator to the other with lots of laughs, gags, and bits of business along the way! The people are laughing and astounded! All the money was counted by the audience members before and after and never touched by the magi, but in a flash, there’s less cash!!! A five-minute routine full of fun and foolery that will leave your crowds both puzzled and pleased! COMES COMPLETE WITH THE GIMMICKS YOU WILL NEED! Includes two specially made leatherette wallets, and a DVD featuring live performances of Robert at the famous Magic Castle in Hollywood, plus his detailed explanation with all the funny lines, bits, shtick, jokes, ad-libs and his helpful thoughts on presentation and comedy included for your use. A GREAT COMBO DEAL! THE DVD with Live Performances, instructions, and tips on handling, PLUS TWO LEATHERETTE WALLETS! Thank you for all the great “stuff”! You are not going to believe it but I use your Funny Money in my adult show and can’t wait until I use it again. -John Anderson, President I.B.M. Ring #188, Melbourne, FL. A GREAT COMBO DEAL! THE DVD AND TWO LEATHERETTE WALLETS! Price: ONLY $49.95 INCLUDES FREE SHIPPING IN THE UNITED STATES!! OVERSEAS ORDERS, THE WALLETS ARE SIZED FOR U.S. DOLLARS. OUTSIDE THE U.S. $72.95 with Priority Airmail Shipping included BUT!! Get combined shipping when you order another item from this store to get combined shipping and save money! Email robert@robertbaxt.com with a list of the items you want for shipping charges.